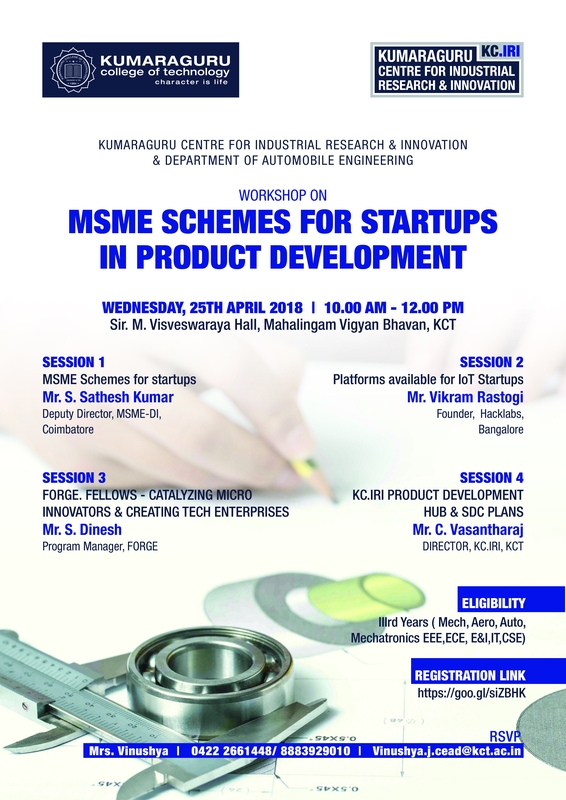 KC.IRI & Department of Automobile Engineering is conducting a workshop on "MSME Schemes for Startups in Product Development" on Wednesday, 25th April 2018 at Sri. M. Visveswaraya Seminar Hall, Dr. Mahalingam Vigyan Bhavan, KCT from 10.00 AM to 12.00 PM. The workshop is aimed at creating an awareness about various funding options, supporting schemes and platforms available for Innovative Product Development for third-year students interested in taking up Product Development projects in their final year. Local Industries interested in Product Development will be attending this workshop to bring out their project requirements. Students can also interact with Industry personnel attending the workshop to look for their support for Product Development and understand their areas of interest and requirements. Mr. Sathesh Kumar, Dy Director of MSME from Coimbatore will be talking about various funding schemes available for student startups and project funding especially on the following schemes available for Industries and Students. 1. MSME - CDP Common Facility Centre (CFC) - http://www.dcmsme.gov.in/mse-cdprog.htm 2. MSME Design Clinic Schemes - http://www.designclinicsmsme.org/ Mr. Vikram Rastogi, founder of Hacklabs (http://www.hacklab.in/index.html#top), a successful Innovation Startup for Product Development located inside NASSCOM IoT COE (http://coe-iot.com/) will be talking about various platforms and schemes available for Product Development Startups to Students. He and his team member will be interacting with KC.IRI IQube and Re Students working on various Product Development Projects to provide valuable inputs for successful product development and commercialisation. 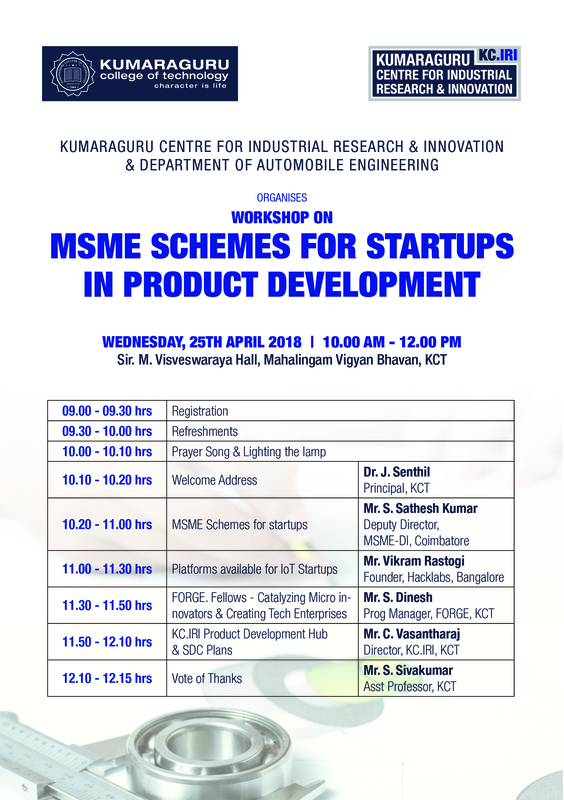 This interactive workshop will bring out the details about MSME schemes, KCT intentions and plans and also project to industries about KCIRI & FORGE. Interested Third-year students can attend the workshop to involve in Product Development Projects with Industries and create awareness to for various schemes and platforms available for Product Development Startups. Interested Students can register for attending the workshop through the link https://goo.gl/siZBHK or mail to kc.iri@kct.ac.in or Contact Mrs. J. Vinushya, Project Coordinator, CEAD, KCT at 0422 2661448.